We all know the ultraviolet (UV) radiation from the sun can wreak havoc on our skin. UV-A causes the signs of aging, while UV-B is the culprit in sunburn and skin cancer. And plants, even as they harvest their energy from the sun, also need protection from the damage it can cause. Cartenoids, pigments with antioxidant properties, provide this protection by removing oxidized molecules during the process of photosynthesis. They also give many plants their orange, red, or yellow colors. Carotenoids can also help when it comes to human UV protection. Studies have shown the sun-protective effects of lycopene, a carotenoid found in tomatoes. One study in particular found that eating five tablespoon of tomato paste daily (providing about 16 milligrams of lycopene) reduced UV-related skin redness and skin damage by about the same amount that an SPF-3 sunscreen would have provided. Clearly, eating tomatoes will not provide anyone with strong enough “natural sunscreen” to rely on this alone for UV defense, but it can certainly be used as a healthy and delicious way to add a little extra protection. Tomato juice, tomato paste, tomato soup, and other concentrated products are your best bets for adding lycopene to your diet. A cup of tomato soup contains about 25 milligrams of lycopene. On the other hand, a fresh, medium-sized, raw tomato contains only about 4 milligrams, meaning you would have to eat six whole tomatoes daily in order to fet the same protective benefits of just a cup of tomato soup. Cooking greatly increases the amount on lycopene in the tomato, though it reduces the amount of vitamin C. An advantage of many Mediteranean dishes is that they combine tomatoes with olive oil; eating healthy fats such as olive oil at the same time as lycopene increases the body’s ability to absorb and use carotenoid. As an added bonus, lycopene has been shown to reduce the risk of heart disease and to protect against some cancers. It may also inhibit the production of collagenase, an enzyme that breaks down collagen and contributes to sagging, wrinkled skin. Other fruits and vegetables high in lycopene are bell peppers, carrots, papaya, pink grapefruit, and watermelon. 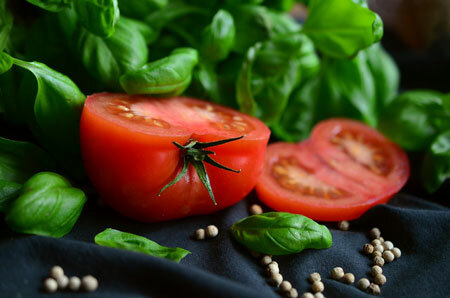 Add these to your diet, along with tomatoes, to enjoy the benefits of lycopene.